An experimental device converted energy from a beating heart to provide enough electricity to power a pacemaker , in a study presented at the American Heart Association’s Scientific Sessions 2012. The findings suggest that patients could power their pacemakers — eliminating the need for replacements when batteries are spent. In a preliminary study, researchers tested an energy-harvesting device that uses piezoelectricity — electrical charge generated from motion. 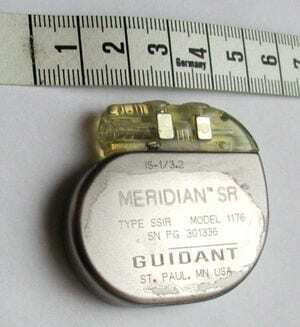 Today’s pacemakers must be replaced every five to seven years when their batteries run out, which is costly and inconvenient, Karami said. Researchers measured heartbeat-induced vibrations in the chest. Then, they used a “shaker” to reproduce the vibrations in the laboratory and connected it to a prototype cardiac energy harvester they developed. Measurements of the prototype’s performance, based on sets of 100 simulated heartbeats at various heart rates, showed the energy harvester performed as the scientists had predicted — generating more than 10 times the power than modern pacemakers require.